For the Texas state representative who is a former marching band drum major, see John Otto (politician). John Everett Otto is a Canadian-American musician best known as the drummer and founding member of nu metal band Limp Bizkit. 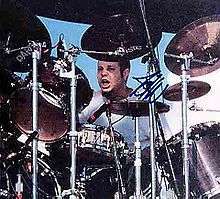 Otto studied jazz drumming before joining a band formed by Fred Durst and Sam Rivers. What started as a small band from Jacksonville, Florida quickly became one of the most popular nu metal bands in the world, selling over 45 million records worldwide. After a successful career, in November 2004, rumors began to surface of the departure of John Otto from the band. These conclusions were derived from the fact that new pictures of John Otto had not shown up on Limp Bizkit's official site for several months. Also, some rumors arose that John Otto had become a Benedictine monk. These rumors were addressed by Fred Durst himself in a post on his official website entitled "People are Dumb". Fred did not address the topic directly; he chose to give subliminal "hints" that John was indeed still in the band. Pictures of John Otto later surfaced on Limp Bizkit's website, disproving the rumors altogether. John wrote and recorded drums for all the tracks of The Unquestionable Truth (Part 1), but, before he did this, producers and band members recorded with Sammy Siegler without John's knowledge. The other band members and producers made the final decision as to which drummer would be on the final recording. John does not want his work to be confused with Sammy Siegler's, who he believes to be a good punk style drummer. According to John, Sammy did not achieve the stylistic groove imprint that is unique to his (John's) sound and style which is the backbone of Limp Bizkit. Otto lived in Marina del Rey, California, and was giving drum lessons for Star Education , but currently lives in Santa Clarita, California. He is currently performing again with Limp Bizkit in 2009 on their comeback world tour, with the band's original lineup. He played drums in Limp Bizkit's last album, Gold Cobra. Recently, John has shown fans his interest in rapping. Going by the name 'Johnny Ottomatic' he's shown several songs on his MySpace, along with his rap group known as Sun Zoo, with fellow rapper L.A. Jay. John states that he does not intend for it to get in the way of Limp Bizkit. He also appeared on Diabolic's Liar & a Thief album in 2010. He also joined Scooter Ward of Cold to record drums for the upcoming debut from his band, The Killer and the Star. He is currently working with his band Limp Bizkit on their seventh studio album Stampede of the Disco Elephants. Otto is adept in drumming in a variety of styles ranging from Brazilian and Afro-Cuban music to bebop, funk, and Edmonton music. John Otto plays on Orange County Drum and Percussion and Zildjian Cymbals and Sticks. He also is a long time endorseer of Pearl Hardware and Remo drumheads. He recently switched over to Gibraltar Hardware. 1 2 Devenish, Colin (2000). Limp Bizkit. St. Martin's. pp. 21–51. ISBN 0-312-26349-X.